Here at at the BBB we try our best to confine our coverage to the New York Yankees. Even when discussing controversial issues, we look at the them through the lens of their impact on the Yankees. Though I will make references to the Yankees, this piece is an exception to our general rule. Yesterday, I came across an article published by the New York Daily News titled, "Major League Baseball must permanently retire 'God Bless America,' a song that offends everyone." Upon reading this piece by columnist Gersh Kuntzman, I became enraged. Not only is it grossly out of my touch with my personal values as an American, but also with those of the overwhelming majority of baseball fans I've come into contact with, especially those who root for the New York Yankees. DISCLAIMER: The views expressed in this piece are my own, and should in no way be generalized with the entirety of the Bronx Bomber Blog. On September 11, 2001, our country was changed forever. Though I am not old enough to remember a pre-9/11 world, I understand the ramifications of those horrid attacks. As a native New Yorker, who is familiar with individuals who lost loved ones on that day, this is an issue that hits home with me. Though the Yankees suffered a heartbreaking defeat in the 2001 World Series, they put together three remarkable comebacks at home to rally the city in the midst of widespread devastation. It was in light of these memories that the Yankees chose to play "God Bless America" during the seventh inning stretch of every home game. Baseball is America's Pastime. Historically, the sport has been a source of great national pride. In many ways, baseball has served as a point of unification for Americans. Regardless of where one stands on the political spectrum, these sentiments often prove true. As someone who attends a couple of Yankees games per year, I can personally attest to the importance of patriotic displays during the seventh inning stretch. Many fans bring American flags to the game, expecting to hold them proudly as Kate Smith's rendition of "God Bless America" plays. The Yankees accompany this ceremony by honoring a veteran prior to the song's playing. As of late, due to the Yankees mediocre play, the Stadium has been said to be so quiet you could hear a pin drop. This is not the case during the seventh inning stretch. Both after the veterans' honoring, and the rendition of "God Bless America," fans enthusiastically applaud. Mr. Kuntzman expresses that he was initially okay with the song being played in the aftermath of 9/11, however he has grown increasingly frustrated with how it has become a mainstay in our baseball tradition. According to Kuntzman, "The song still embodies great things about America, but also our worst things: self-righteousness, forced piety, earnest self-reverence, foam." Simply from reading this article, it's not difficult to get a grasp of Mr. Kuntzman's intentions. It's clear that he's pushing a political agenda. While he certainly has every right to express his sentiments, urging Major League Baseball, and subsequently, the Yankees from abandoning what has become a source of pride, is quite disingenuous. As a political science major, I can delve into Kuntzman's intentions further, but this is not the correct forum for such a debate. Instead, we need to assess whether such suggestions are embraced by a majority of baseball fans, or if he's simply expressing his own views, with the hope of giving them a platform. In his article, he cites a poll conducted by Sheryl Kaskowitz for her 2013 book, "God Bless America: The Surprising History of an Iconic Song." The poll reportedly found that 61% of baseball fans did not want the song played during games. I'm no expert on polling, but I'd surely like to see whether or not this was conducted scientifically, meaning what's the sample size, where was the sample taken from, and what are the political affiliations of those included in the sample. Neglecting to mention this information, which is integral to the validity of any credible poll, gives me reason for concern. In fact, we have conducted a running poll on our twitter account, and so far (although we must note that nearly all of our followers are Yankee fans so the results cannot be generalized to all baseball fans), a commanding 98% of people voted that no, they are not offended by the song. Yes! NINETY-EIGHT PERCENT! Major League Baseball has no uniform rule pertaining to the playing of "God Bless America" at its games. Each team has been given discretion as to when, or IF, it chooses to play the song at all. He even notes in his article that some teams, like the Mets, only play it on Sunday's and holidays. The Yankees, on the other hand, likely due to the organization's unique bond with the song, and the moments of struggle it symbolizes, have opted to include it on an every day basis. If fans truly did have an issue with the song, it would have been expressed. As previously stated, however, Yankee Stadium is often at its loudest during the seventh inning stretch. New York City has been through a lot. The Yankees will forever be connected with the city's recovery from the 9/11 attacks. By continuing this tradition, which showcases the city's perseverance, the Yankees are doing their due diligence. As we celebrate Independence Day this year, we should realize there are more important issues to discuss than baseball teams choosing to play a song that a vocal minority find "offensive." If an overwhelming majority of fans shared Mr. Kuntzman's concerns, they would make it known by boycotting games, or taking other measures to express their discontent. Since this has not happened, I suspect Mr. Kuntzman is in the minority on this issue, especially if polled with Yankees fans. 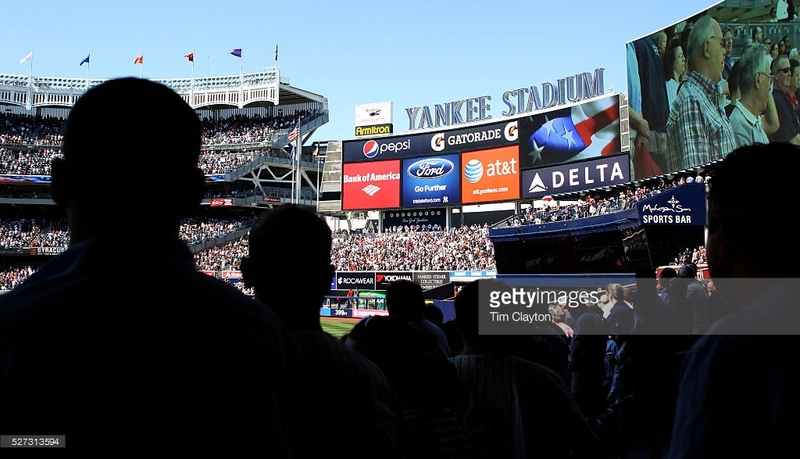 The Yankees' decision to uphold their tradition of playing "God Bless America" during the seventh inning stretch is something that makes me proud of the organization I root for. Mr. Kunztman acknowledges in his article that he is indeed a Mets fan. In light of this, I invite Mr. Kuntzman to attend a Yankees game so he can observe the passion with which fans connect to the song. It's more than just a song. It's a reflection on tougher times, and the battle many have had to go through to overcome adversity. While this debate certainly raises a number of political issues, I urge fans, regardless of their affiliation, to appreciate the song's unique importance for the New York Yankees. The Yankees pride themselves on pride, tradition, and pinstripes. As cliche as this may sound, the playing of "God Bless America" fits in perfectly with the tradition category. Caving to Mr. Kuntzman's demands would be a disservice to the thousands of fans who show up to Yankee Stadium expecting to express their patriotic sentiments.